Less Tar, More Tasteless: Back covers from January and February 1960. The proportion was likely higher for humor magazines: Even the shoddiest campus chuckle-sheet typically had a four-color, full-page cigarette ad on its back cover, and a fat book like the Yale Record might run several more inside. The revenue from one such ad often covered an issue’s entire production cost. In return, prudent editors stifled the urge to crack jokes about cancer sticks. This quid pro quo normally went unspoken, but on the rare occasions it was violated Big Tobacco’s minions on Mad Ave. weren’t shy about reminding the kids who signed the checks. The only unusual feature of this 1960 dust-up involving L&M and the Stanford Chaparral is that the latter made it public. L&M debuted in 1953 as Liggett & Myers’ entry in the fast-growing filter-cigarette category. The Surgeon General’s report was still a decade away, but already there was growing evidence linking smoking to lung cancer. The industry’s response was a flurry of filtered and mentholated brands pitched as “milder,” “cleaner” and “cooler” than traditional smokes; if customers assumed they were also safer, so much the better. 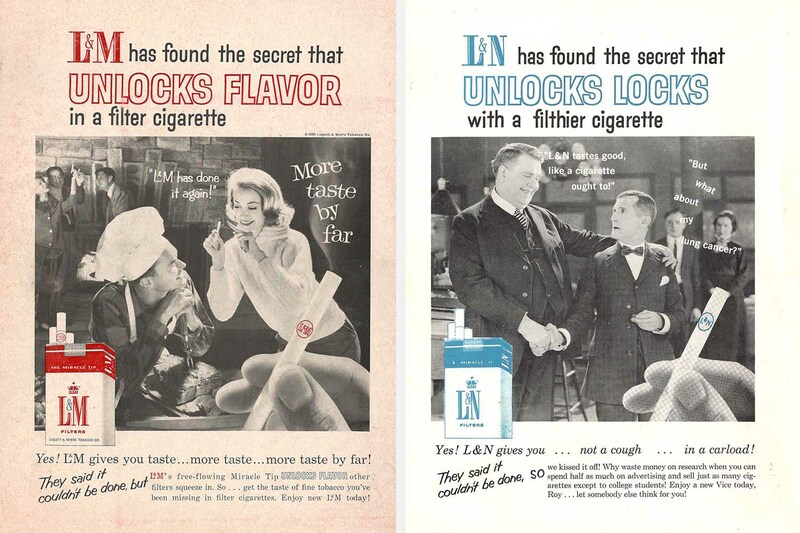 By the late ’50s, the Big Three advertisers of previous decades — Chesterfield, Camel and Lucky Strike — had given way to L&M, Winston (born 1954), Salem (b. 1956) and a rebranded Marlboro (b. 1924 as a “woman’s cigarette,” butched-up in 1955). 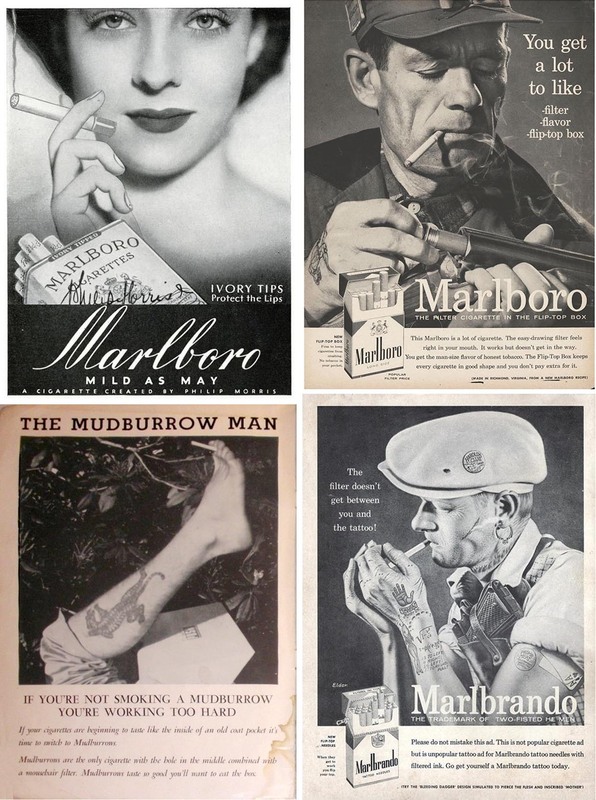 Marlboro ads from 1935 and 1955; spoofs from Nov. 1957 Cal Pelican and April 1956 Mad. L&M’s first Chaparral ad ran on the February 1959 back cover, a spot it held on six of the next eight issues. College Magazines, Incorporated, the New York agency that placed national ads in most campuses, normally supplied a fresh pitch every month, whether the product changed or not, but the January 1960 Chaparral reprinted the L&M ad from December. The “L&N” parody appeared in February, and in March editor Ray Funkhouser received a very unhappy letter from a College Mags account manager named Philip Knowles. Knowles’ letter was published in the May 1960 issue. It packs so much sarcasm, condescension, realpolitik and bare-knuckle intimidation into a few hundred words that it deserves to be read in toto, but the highlight is surely the righteous disapproval of tasteless louts who “think remarks about cancer are funny.” In reply, the editors brazenly pled guilty as charged, then insinuated College Mags’ indignation had more to do with money than morality. * Elizabeth Crisp Crawford, Tobacco Goes to College: Cigarette Advertising in Student Media, 1920-1980, (McFarland & Co., 2014), p. 34. Most of the book is a detailed study of one newspaper, The Orange and White at the University of Tennessee. Crawford barely mentions college humor mags, but their rise and fall correlates perfectly with the ebb and flow of cigarette ads in the O&W: Both took off in the ’20s, held on through the Depression, dipped during World War II, came back strong in the late ’40s and flourished in the ’50s. This entry was posted in College Parodies, College: 1946 on and tagged 1960s, Advertising, College Parodies, Stanford Chaparral. Bookmark the permalink.